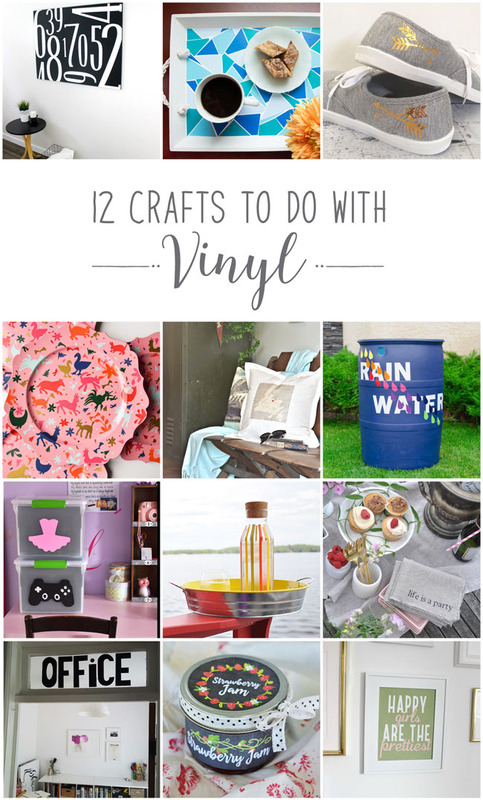 This month, our #12monthsofdiy projects are sponsored by Expressions Vinyl. When I found out that our material was adhesive vinyl, I knew exactly what I would do. This diy/organizing project has been a long time coming. I mean a looooong time! If you are pregnant or the parent of a young child, I urge you to start a memory box right now. I mean it...go now. This is a case of "Do as I say, not as I do." 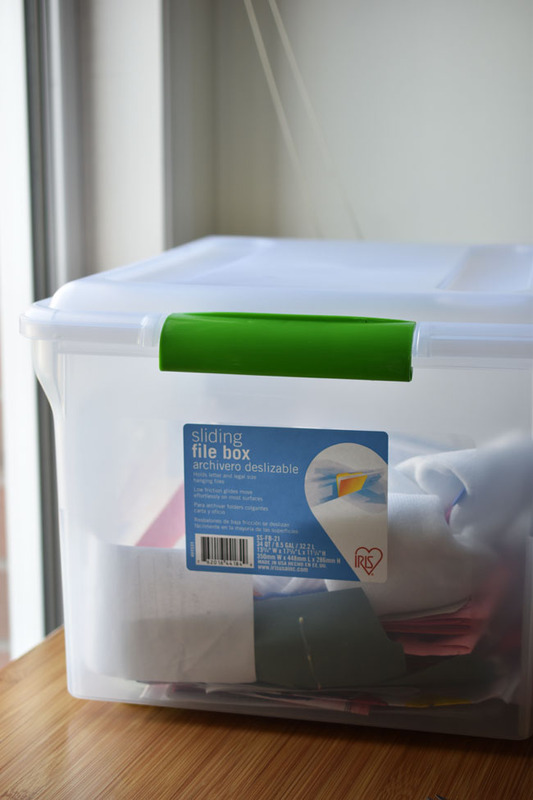 Rather than creating these handy, tidy, stackable memory boxes when my kids were small, I just got around to doing them now...when my son is going into high school. With daycare and 10 years of school behind him, it isn't a pretty organizing job! 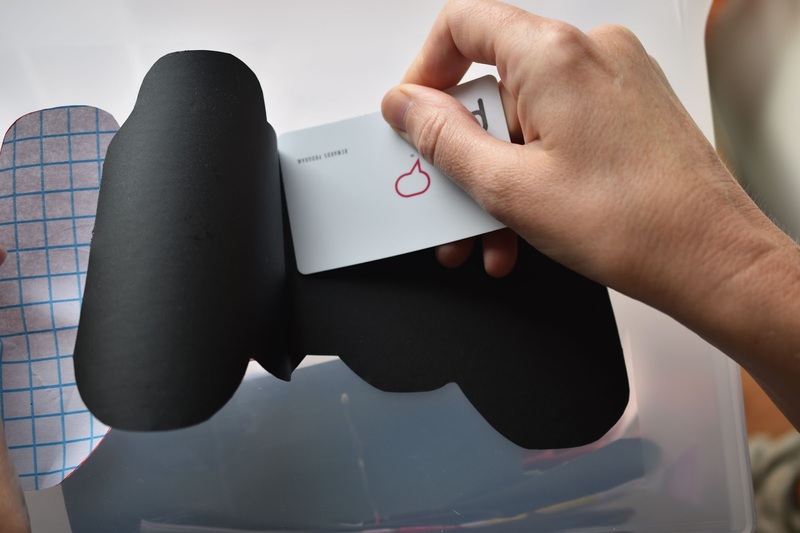 There are so many creative things you can do with vinyl. 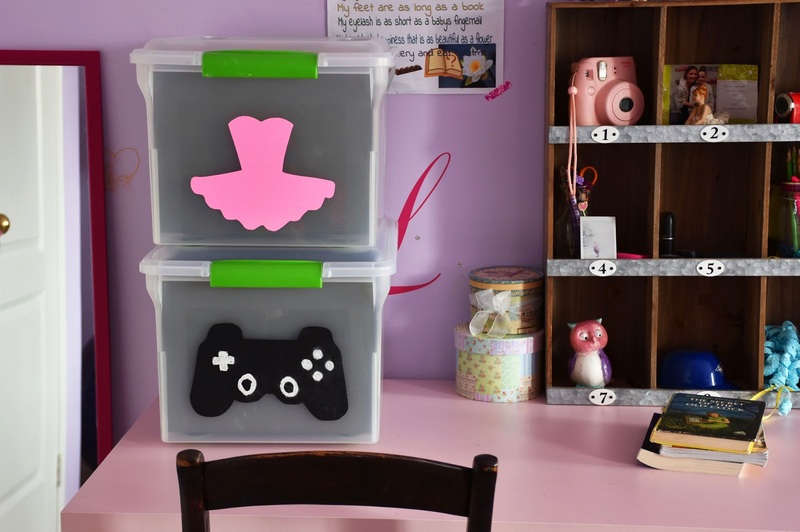 As you know, the options are endless if you have a very cool machine like the Cricut Explore Air™ Machine. But don't feel that you can't do a fun vinyl diy without one of these lovely machines. My vinyl decals were hand-cut. 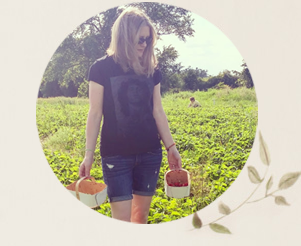 And some of the other bloggers whose projects are linked up below created their diys without a machine. Expressions Vinyl has many colours and patterns of vinyl to choose from. If you think you might use a variety of colours, I recommend ordering a pack. I got the basic, girls and boys packs, and there are theme packs for occasions such as Halloween, Thanksgiving and Christmas too. I wanted to ensure it would be easy to spot which box belongs to my daughter and which box to my son. 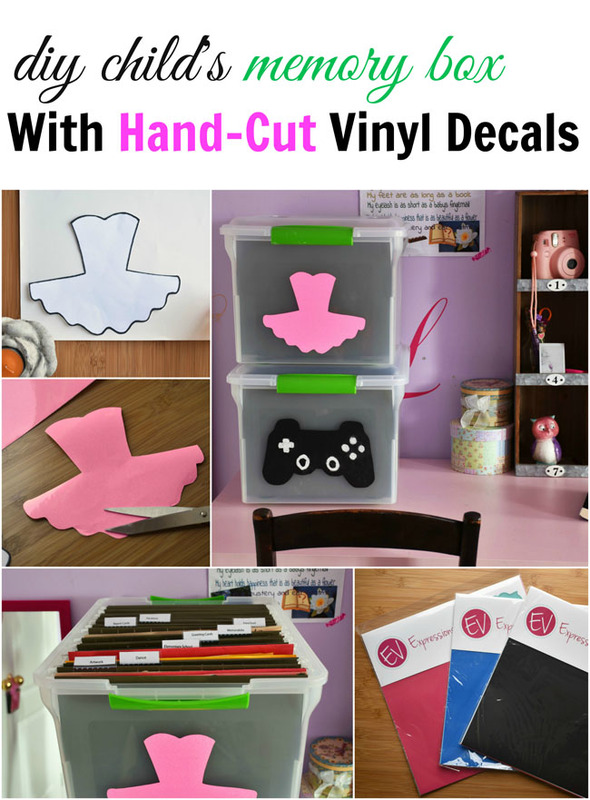 I initially thought about cutting their initials from vinyl (and I still think that's a great idea), but then I thought it would be cute to cut decals to reflect their interests. My daughter has lots of programs and tickets from her dance recitals in her box, so I chose to create a ballerina tutu decal. I simply printed a black and white template - I used this one that's actually intended for cookies because I wanted something that would be easy to cut by hand. 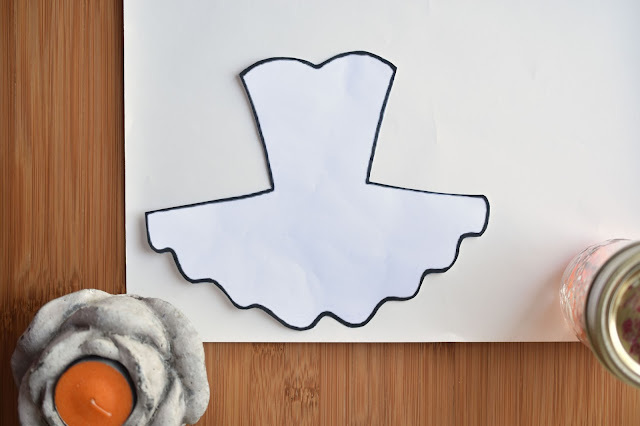 I then cut out the tutu template and placed it on the back of the vinyl. Then I traced the outline onto the vinyl backing with a pen. Easy peasy. I cut the tutu out of the vinyl with sharp scissors, pulled the protective backing off and adhered my decal to the front of the file box. 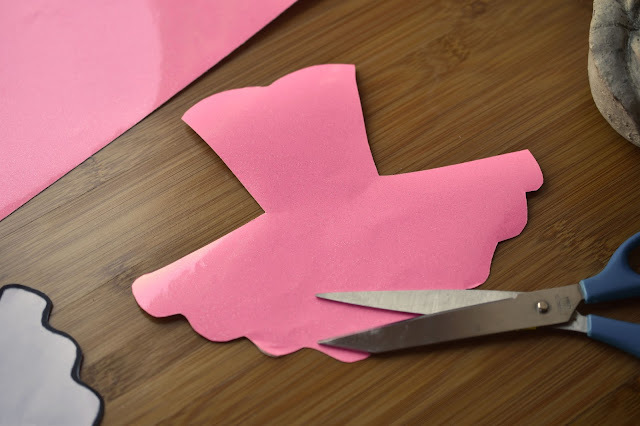 To give the tutu extra punch, I chose pink glitter vinyl. I asked my son what image he would like on his box. He chose a video game controller. (That shouldn't have surprised me.) Again, I wanted an image that would be simple to cut. 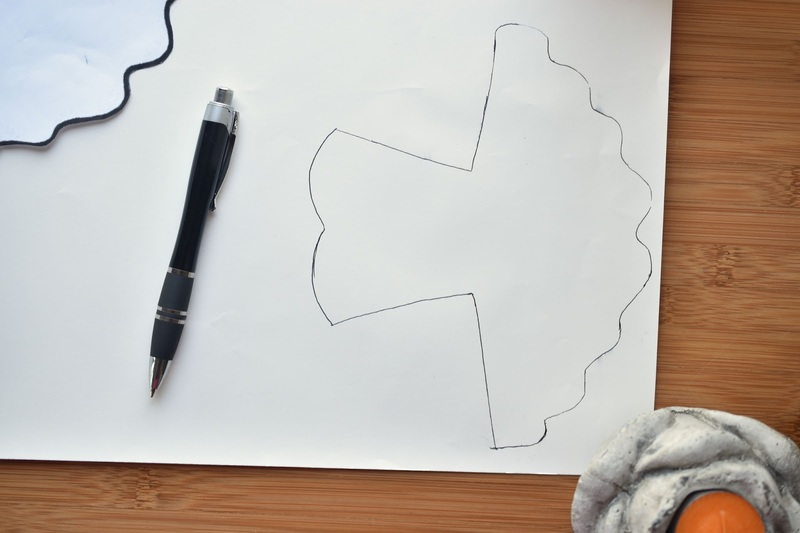 I found a plain game controller outline online. I had some Expressions Vinyl chalkboard vinyl, so I decided to cut the video game controller from that and draw the controller parts on with chalk to make it look more authentic. As I applied the video game controller decal to the box, I started from one end, smoothing about an inch or so at a time with a rewards card and pulling the backing paper off as I went. This enabled me to get a smoother result. I had purchased a large amount of hanging file folders from Costco for my home office filing cabinet. I had plenty left to fill the kids' memory boxes. If you start late in the game, like me, take a look through your stack of memorabilia to identify categories. 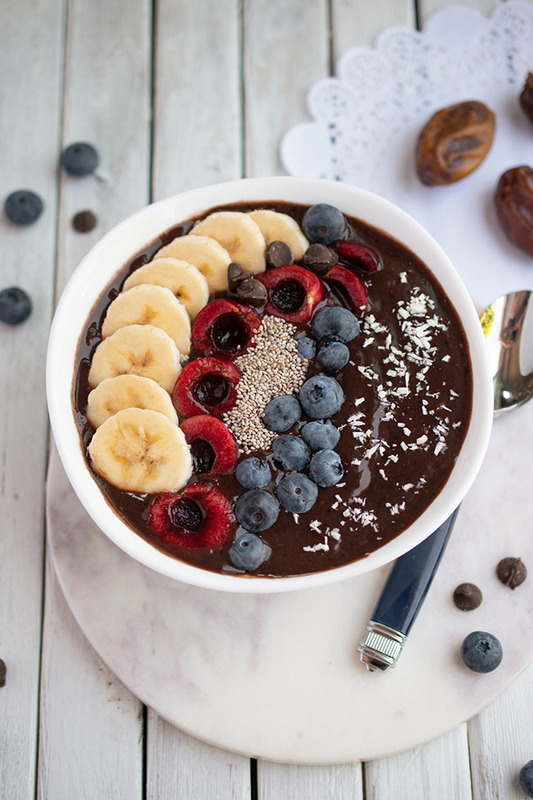 If you start early (yay you!) you might want a file folder for each individual grade. I felt it would be difficult at this stage to break the memorabilia down into grades, so I went with preschool, elementary school and high school. I also included report cards, dance, sports, greeting cards, artwork and vacations. I labelled one hanging file folder as memorabilia for miscellaneous items such as programs from plays and movie tickets. I haven't yet weeded through all the items and I will no doubt add more categories as I go. The challenge so far has been the artwork - you can't fit vast quantities of it neatly in file folders, so some of it just has to go. I decided to keep items of more significance, like the "about me" posters the kids create in the younger grades. My daughter did one all about her brother, expressing his likes and dislikes. "He dislikes me," she wrote. That's a keeper! I'm pretty happy to finally see this long-awaited project come to fruition, and I'm thankful to Expressions Vinyl and my #12monthsofdiy blogging friends for providing me with inspiration. 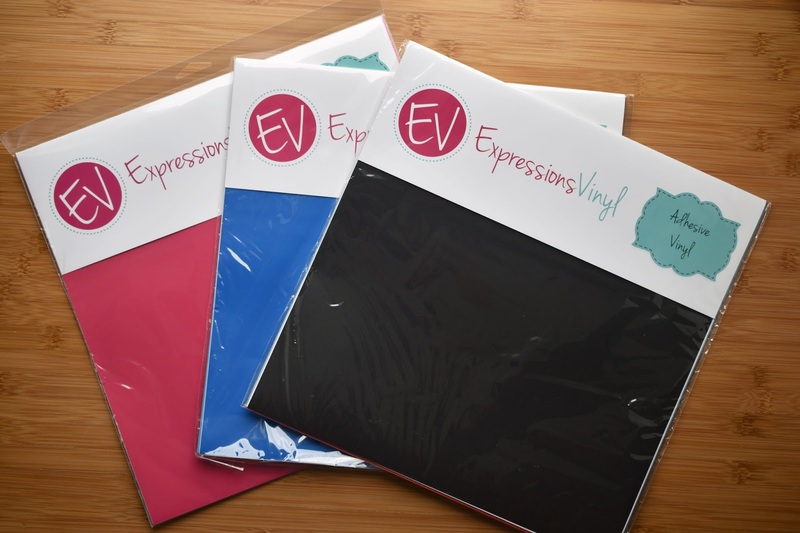 Click Here To Visit Expressions Vinyl to see what vinyl projects you might get up to. 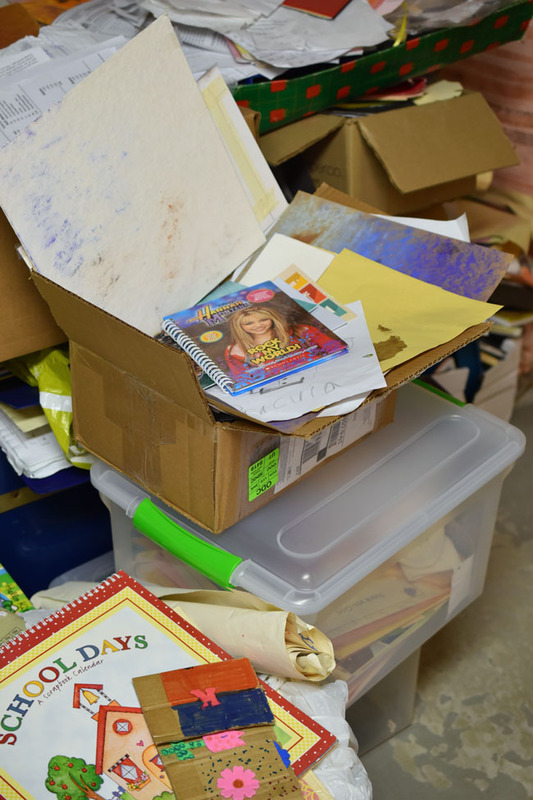 Do you have memorabilia that could use organizing? Have you done any vinyl projects of late? If so, we invite you to share them on Instagram this month using the hashtags #12MonthsofDIY and #AugustVinyl. We're going to pick our fave project to feature on all of our accounts at the end of the month. Now it's time to see the rest of the DIY vinyl project ideas from my Canadian blogging friends! DIY personalized throw pillow – home is where the heart is from Vin'yet Etc. *This is a sponsored post and contains affiliate links. All opinions are authentic and my own. Thank you for supporting the awesome companies that partner with Woman in Real Life. True! So many people shy away from vinyl without a machine. I love that you still did something cool and original without one. 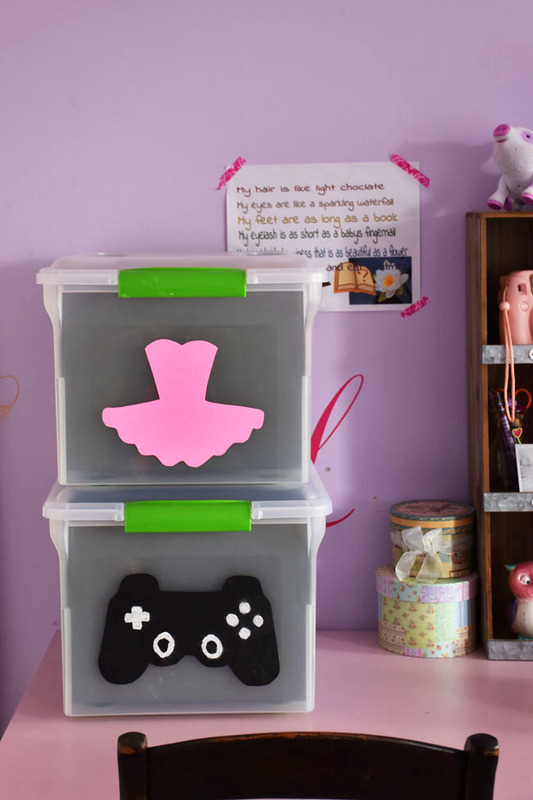 I would be proud to get a memory box like that one day down the road. Great idea, it's so hard to deal with so many papers even keepsakes. This is the perfect solution. Holy smokes, your organizational skills are like super hero level! this idea is so fantastic, I love it! I'm so opposite, I've kept very little and now I want a tote like this! :( I seriously love it! 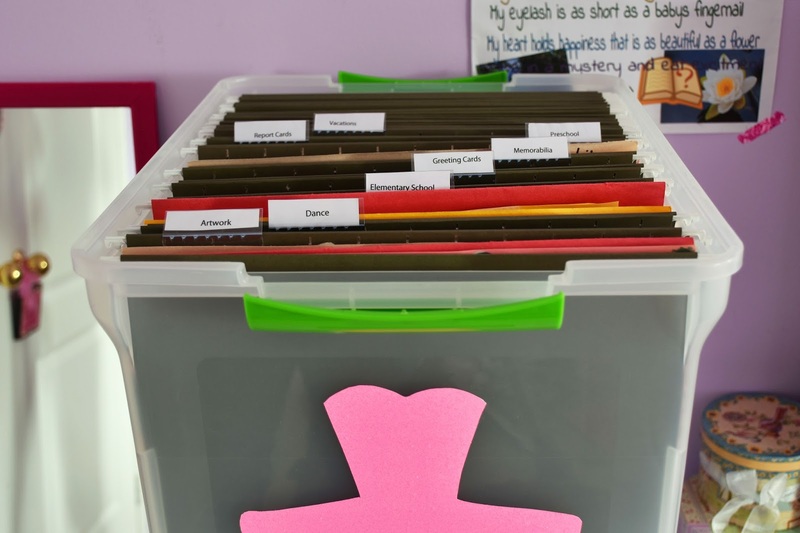 Good for you for getting organized! Ummm.... I'm sending my youngest off to university and I still have paperwork I should organize for her! It's never too late, right ;)? Great project, and very inspiring! Definitely never too late! I may still be working on this when my youngest heads to university...haha. This is very clever and bravo for still organizing so many years later. I love your story about when your parents showed up with a motorhome filled with items from your childhood! Excellent advice! My daughter just recently permanently moved out and added some items from her recent university graduation to her school box that starts with items from kindergarten. It is not complete and has some meaningful artifacts of her entire education journey. you will be happy in the long run you took the time. I might need a bigger box for university! ;) Thanks so much Thea. This is a great idea! I can definitely see myself making these for my girls one day! Once they round-up even stuff to need a bin! lol (two and under right now!). The stuff starts accumulating pretty darn quick. Get the boxes ready now, haha. Such a cute idea! I have a stack of these totes as well that I can do this with. And I need to get myself organized before school starts again!